Manufacturing used to be one of the largest industries in America. In 1910, the Bureau of Labor Statistics estimated that nearly one-third of workers worked in manufacturing. Today, that number has shrunk to 8.7%. Many smaller cities that historically relied on these manufacturing jobs have suffered as a result of their decline. But manufacturing in America is probably more robust than you imagine. Many metro areas across the country have growing manufacturing sectors that employ workers in good jobs and enable them to save for their future. Below we look at data on six factors to rank the best places to work in manufacturing. Specifically, we look at the manufacturing share of the workforce, percent change in manufacturing jobs from 2013 to 2016, percent change in average manufacturing income from 2013 to 2016, percent change in manufacturing jobs from 2015 to 2016, percent change in manufacturing income from 2015 to 2016 and manufacturing income as a percent of local housing costs. Check out our data and methodology below to see where we got our data and how we put it together to create our final rankings. This is our third annual look at the best places to work in manufacturing. Check out the 2017 version here. Midwest does well – Five of the top 10 best places to work in manufacturing are in the Midwest. Michigan, a state with a rich manufacturing history, scored particularly well with three metro areas in the top 10. Rising manufacturing in the South – Midwest metro areas split the spoils at the top with metro areas in the south. 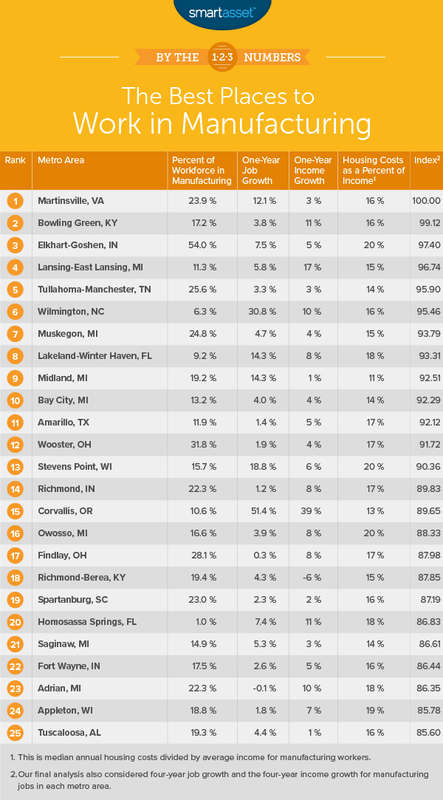 In fact, the top two ranked metro areas, Martinsville and Bowling Green, are both in the South. 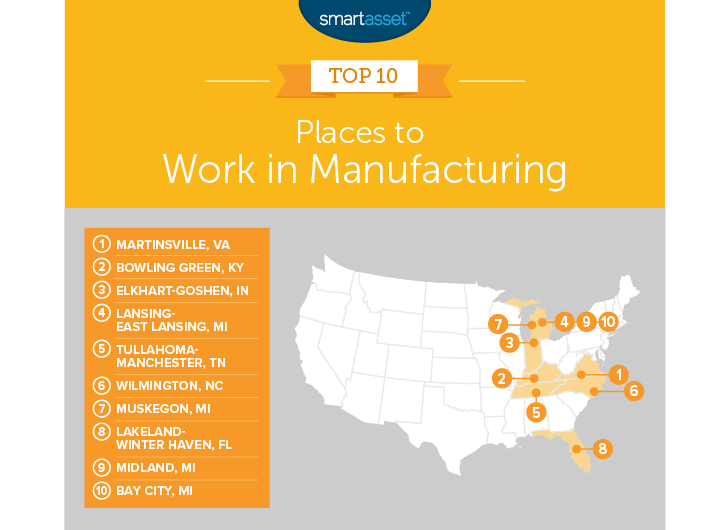 Located in southern Virginia, Martinsville ranked as the top spot to work in manufacturing. According to our data, nearly 24% of workers here work for a manufacturing firm. For that metric, Martinsville ranks 42nd. In the future, we may see manufacturing play an even larger part in the local economy. From 2013 to 2016, the number of people working for manufacturing companies grew by nearly 23%. From just 2015 to 2016 alone, Martinsville saw a 12% growth in manufacturing jobs. Bowling Green, Kentucky takes second. More than 17% of the workforce in this metro area works for a manufacturing firm. The manufacturing industry here is also on the rise. From 2013 to 2016, the number of people working for manufacturing businesses grew by 12%. But what makes Bowling Green stand out is the pay. From 2015 to 2016, the average pay for someone working for manufacturing firms in Bowling Green increased by 10.5%. For that metric, Bowling Green ranks in the top 25. Located about 15 miles east of South Bend, Indiana is the Elkhart-Goshen, Indiana metro area. Transportation equipment manufacturing is the biggest gig in town, with 182 establishments employing 36,551 people. Specifically, Elkhart-Goshen specializes in travel trailer and camper manufacturing. Overall, 54% of the Elkhart-Goshen workforce works for a manufacturing firm, the most in the nation. There doesn’t seem to be any stopping Elkhart-Goshen’s manufacturing growth either. From 2013 to 2016, the number of people employed by manufacturing firms grew by more than 19%. Early in its history, Lansing was an automobile manufacturing powerhouse. Today the economy is more diverse, with Michigan State University playing an important role. But despite the evolution of the Lansing-East Lansing economy, manufacturing is still prevalent. For example, General Motors has a high-tech manufacturing facility in the area. Lansing topped this list because of the pay available to people working for manufacturing firms. From 2015 to 2016, average pay for someone at a manufacturing firm in Lansing-East Lansing grew by 17%. From 2013 to 2016, average manufacturing pay grew by 19%. Tullahoma-Manchester is located in Tennessee along the southern border. More than 8,300 people here are employed by manufacturing establishments. Transportation equipment manufacturing is also prevalent here. Some 3,100 of the 8,300 manufacturing employees work in motor vehicle parts manufacturing. In total, just under a quarter of workers in this metro area are employed by manufacturing firms, the 31st highest rate in our study. Tullahoma-Manchester is also an affordable place for the average person working in manufacturing. According to our data, the local housing costs are equal to 14% of income for the average person working for a manufacturing firm. Wilmington, North Carolina takes sixth. The manufacturing industry in Wilmington is fairly diverse. Of the nearly 6,600 manufacturing employees, 1,300 work in fabricated metal product manufacturing, 1,100 work in transportation equipment manufacturing and 1,400 work in chemical manufacturing. Compared to other cities, manufacturing is not the end-all and be-all in Wilmington. Only about 6% of the workforce is employed in manufacturing. However, jobs and incomes are rising for people employed by Wilmington manufacturing firms. Wilmington ranks in the top 35 for all four of our job-growth and income-growth metrics. Michigan dominates the bottom part of this top 10. Coming in seventh is Muskegon, a metro area where about 13,000 people, or 25% of the total workforce, work for manufacturing firms. Particularly prevalent here are foundries, which employ 3,158 people. Manufacturing in Muskegon, while already widespread, continues to grow. From 2015 to 2016, the number of people Muskegon manufacturing firms employed grew nearly 5%. Outside of the large and growing number of manufacturing jobs, manufacturing pay here is also good relative to housing costs. Muskegon ranks in the top 15% of cities for housing costs as a percent of average manufacturing income. Florida’s lone representative is Lakeland-Winter Haven. This metro area is located in central Florida just east of Tampa Bay. This metro area has a diverse manufacturing economy. Food manufacturing employs a large number of people, along with printing and machinery manufacturing. Lakeland-Winter Haven ranked well because of the growing number of manufacturing jobs. From 2013 to 2016 alone, the number of people employed in manufacturing grew by just under 19%. That pace accelerated from 2015 to 2016 when manufacturing job growth topped 14%. Incomes for manufacturing employees here is also rising. Lakeland-Winter Haven ranked in the top 40 for both of our pay-growth metrics. Our list rounds out with two Michigan metro areas. Midland takes ninth and is a fairly small metro area. In total, Midland has just under 35,700 workers. Of those, slightly more than 19% work for manufacturing firms. The good news for the local manufacturing economy is that the number of jobs is growing. The number of people employed by manufacturing firms grew by just over 14% here from 2015 to 2016. Most importantly, though, the cost of living in Midland is low. Census Bureau data shows that someone working in manufacturing here should be able to afford a mortgage, save for retirement and invest without much trouble. Finally, our tour of booming manufacturing metro areas takes us to Bay City Michigan. Only 13% of workers in Bay City are employed in manufacturing. But that number may grow. From 2013 to 2016 the number of manufacturing jobs in Bay City grew by over 21%. Job growth over that period also coupled with decent raises for manufacturing workers. Average income for workers at manufacturing firms grew 9% from 2013 to 2016. Manufacturing as a percent of the workforce. This is the percent of all workers employed by manufacturing firms. Data comes from the Census Bureau’s 2016 County Business Patterns Survey. Job growth from 2013 to 2016. This is the percent change in people employed in manufacturing firms from 2013 to 2016. Data comes from the Census Bureau’s 2013 County Business Patterns Survey and the Census Bureau’s 2016 County Business Patterns Survey. Job growth from 2015 to 2016. This is the percent change in people employed by manufacturing firms from 2015 to 2016. Data comes from the Census Bureau’s 2015 County Business Patterns Survey and the Census Bureau’s 2016 County Business Patterns Survey. Income growth from 2013 to 2016. This is the percent change in manufacturing workers’ average incomes from 2013 to 2016. Data comes from the 2010 Census Bureau’s County Business Patterns Survey and the 2015 Census Bureau’s County Business Patterns Survey. Income growth from 2015 to 2016. This is the percent change in manufacturing workers’ average incomes from 2015 to 2016. Data comes from the Census Bureau’s 2014 County Business Patterns Survey and the Census Bureau’s 2015 County Business Patterns Survey. Housing costs as a percent of income. Data on incomes comes from the Census Bureau’s 2016 County Business Patterns Survey. Data on median housing cost comes from the Census Bureau’s 2017 American Community Survey. Save early – Most people know that it is better to save earlier than later. But how much of a difference can it make? Here’s an example: say you invest $5,000 and let it grow for 10 years with 6% returns. After 10 years, your initial investment would have doubled to $10,272. But let’s say you decided to invest it 10 years earlier, giving you an extra 10 years of investing time. In that scenario, your $5,000 would have turned into nearly $20,000. By just investing earlier, you give your investments time to accrue value and you reap the benefits of compound interest. Get an expert’s opinion – Saving for retirement is difficult. You can’t say for sure how much you will need in retirement. Plus, as you grow older, you will need to move from investing in riskier assets to less risky ones. But how do you know when to start that switch. Instead of worrying over all that, why not get the best advice money can buy from a financial advisor? A financial advisor can make sure you are fully prepared for the retirement of your dreams. If you are not sure where to find a financial advisor, check out SmartAsset’s financial advisor matching tool. It will match you with up to three local financial advisors.